There is only highly recognized Standard for basset hounds in the United States. 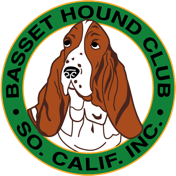 That Standard was developed by members of the Basset Hound Club of America, Inc. and adopted by the American Kennel Club. Judges at AKC sanctioned dog shows and matches use this Standard to judge the dogs appearing in their ring. The purpose for these events is to assist breeders in selecting the best breeding stock. Reputable/responsible breeders breed to this Standard. General Appearance — The Basset Hound possesses in marked degree those characteristics, which equip it admirably to follow a trail over and through difficult terrain. It is a short-legged dog, heavier in bone, size considered, than any other breed of dog, and while its movement is deliberate, it is in no sense clumsy. In temperament it is mild, never sharp or timid. It is capable of great endurance in the field and is extreme in its devotion. Head - The head is large and well proportioned. Its length from occiput to muzzle is greater than the width at the brow. In over-all appearance the head is of medium width. The skull is well domed, showing a pronounced occipital protuberance. A broad flat skull is a fault. The length from nose to stop is approximately the length from stop to occiput. The sides are flat and free from cheek bumps. Viewed in profile the top lines of the muzzle and skull are straight and lie in parallel planes, with a moderately defined stop. The skin over the whole of the head is loose, falling in distinct wrinkles over the brow when the head is lowered. A dry head and tight skin are faults. The muzzle is deep, heavy, and free from snipiness. The nose is darkly pigmented, preferably black, with large wide-open nostrils. A deep liver-colored nose conforming to the coloring of the head is permissible but not desirable. The teeth are large, sound, and regular meeting in either a scissors or even bite. A bite either overshot or undershot is a serious fault. The lips are darkly pigmented and are pendulous, falling squarely in front and, toward the back, in loose hanging flews. The dewlap is very pronounced. The neck is powerful, of good length, and well arched. The eyes are soft, sad, and slightly sunken, showing a prominent haw, and in color are brown, dark brown is preferred. A somewhat lighter-colored eye conforming to the general coloring of the dog is acceptable but not desirable. Very light or protruding eyes are faults. The ears are extremely long, low set, and when drawn forward, fold well over the end of the nose. They are velvety in texture, hanging in loose folds with the ends curling slightly inward. They are set far back on the head at the base of the skull and, in repose, appear to be set on the neck. A high set or flat ear is a serious fault. Body - The rib structure is long, smooth, and extends well back. The ribs are well sprung, allowing adequate room for heart and lungs. Flatsidedness and flanged ribs are faults. The topline is straight, level, and free from any tendency to sag or roach, which are faults. Hindquarters - The hindquarters are very full and well rounded, and are approximately equal to the shoulders in width. They must not appear slack or light in relation to the over-all depth of the body. The dog stands firmly on its hind legs showing a well-let-down stifle with no tendency toward a crouching stance. Viewed from behind, the hind legs are parallel, with the hocks turning neither in nor out. Cowhocks or bowed legs are serious faults. The hind feet point straight ahead. Steep, poorly angulated hindquarters are a serious fault. The dewclaws, if any, may be removed. Tail - The tail is not to be docked, and is set in continuation of the spine with but slight curvature, and carried gaily in hound fashion. The hair on the underside of the tail is course. Size - The height should not exceed 14 inches. Height over 15 inches at the highest point of the shoulder blades is a disqualification. Gait — The Basset Hound moves in a smooth, powerful, and effortless manner. Being a scenting dog with short legs, it holds its nose low to the ground. Its gait is absolutely true with perfect coordination between the front and hind legs, and it moves in a straight line with hind feet following in line with the front feet, the hocks well bent with no stiffness of action. The front legs do not paddle, weave, or overlap, and the elbows must lie close to the body. Going away, the hind legs are parallel. Coat - The coat is hard, smooth, and short, with sufficient density to be of use in all weather. The skin is loose and elastic. A distinctly long coat is a disqualification. Color - Any recognized hound color is acceptable and the distribution of color and markings is of no importance. This link is important for pet owners as well as those who show their dogs.